Most of you know that we enjoy traveling. We've been very fortunate to travel so many places in the United States and we really enjoy spending time in our National Parks. When we asked Cameron where he wanted to go after graduation his first thought was Niagra Falls but then he saw a special on the travel channel about Glacier National Park. He knew immediately it was someplace he wanted to see. So, we switched gears and started planning for that. We decided to fly into Seattle so that we could enjoy and revisit some of our favorite places in Washington and then drive over to Montana and to Glacier. We arrived and were greated with clouds and very cool temperatures but we weren't complaining. We drove up to Packwood and started up to Mt. Rainier the next day only to find the road closed due to a freak snow storm two days before. One that stranded hikers up on the mountain and killed one. We were able to get up later in the day but it was so cloudy that we couldn't see a thing and it was snowing on us to top it off. We decided to pack it in that day and went back to our cabi n and enjoyed the scenery. The next day Ron decided that even though there were clouds down low he thought if we drove up we could get above the clouds and see the mountain. Sure enough, we rounded a corner and there she was in all her snowy glory, Mt. Rainier. I can't tell you how beautiful this place is in person, it's just something you have to see for yourself. What scares me so is that it's an active volcano and could one day turn into another Mt. St. Helen's it's sister just a short way over. We didn't get to Mt. St. Helen's on this trip, the weather just didn't cooperate, but we hope to get back soon to see it again. It's always interesting to see how the reforesting is going since it blasted it's top back in 1980. That afternoon we headed over to the town of Antacortes. I just love Anacortes, it's a small town located just on the water. Our hotel had a porch that overlooked the ferry terminal so we got to watch the ferry's coming in and out all evening. For those Grey's Anatomy's fans, you know how Derek feels about the ferry's well so do I! I don't know what it is but I love to watch and to ride the ferry's in the Washington area. The next morning we were up early to take the ferry over to Friday Harbor, one of the San Juan Islands. We had a whale watching tour scheduled that afternoon. After we arrived in Friday Harbor, we checked in for our tour and then walked around town before having some lunch. Our tour left at 1 p.m. and we were greeted with the fact that the whales were really active and we were heading out to where two pods were converging! We did a tour back when Cameron was 3 and he slept through it, so this was a big deal. We were not disappointed! 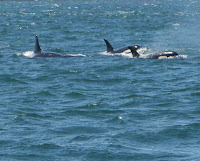 The first time we did this tour, we saw about 5 maybe 6 whales. This time there were probably 15-20! They were everywhere. The natualists on board said that they thought there might have been three pods instead of just the two. I think it was mating season because there was a lot of showing off going on. It was just such a miraculous sight! Once you see them out in the wild, you never view Sea World the same way. Now, don't get me wrong I appreciate all the Sea World does and the research accomplished there but these whales belong out in the ocean. I hope you enjoy these photos, they are some of my favorites from the day! Ok, so I know the picture on the right isn't an Orca but we got to see several bald eagles while out in the area. Ron took this one, and I think he looks so regal! The last part of our trip was spent at Glacier National Park. WOW is all I can say! It truly is a beautiful place and one I'll visit again although you really have to want to go there as it's not an easy place to visit. The freak June storm that hit Washington also hit Montana and had dumped 12 FEET of snow the weekend before we arrived. Unfortunately, this delayed the opening of the Going to the Sun road and we were only able to get 12 miles up one way and then we had to drive around to the other side and we were able to go 14 miles up that side. While that was disappointing we didn't let it get us down. We enjoyed hiking many trails and seeing this wonderful place. I hope you enjoy these photos and maybe they'll even inspire you to plan a trip to visit one of our great National Parks! What a beautiful place!! One of these days. . . What great photos you took. Love the whales! !